A case study on pack of principles, that helped SaaS company grow by 150% in just 5 months. All despite the traffic drop during summer. Disclaimer: this is a translated case study of a Russia based company. It is featured in Tools for business series (engagement based dialog via email) to emphasise importance of DOING things (i.e. hustle) instead of never ending learning. In March 2018, I joined marketing team of an online service and promised to increase registrations by 20% each month while maintaining the Cost Per Lead (CPL) level. The picture below shows the results achieved in five months. This article will help you reach the same goal by organising lead generation. It is easy to grow by 20% if you work in a startup that has just “hatched” — you just gradually launch and optimize different channels to attract customers. We had a different strategy. At that time PlanFact (a financial accounting service for small businesses) was struggling with competitors in the market for several years, and was changing contextual and targeted advertising, trying a lot of channels and had to fire several agencies and marketers. The team managed to earn their first million without investment and was looking for ways to scale, sometimes wasting $2500 per business blog post on advertising. 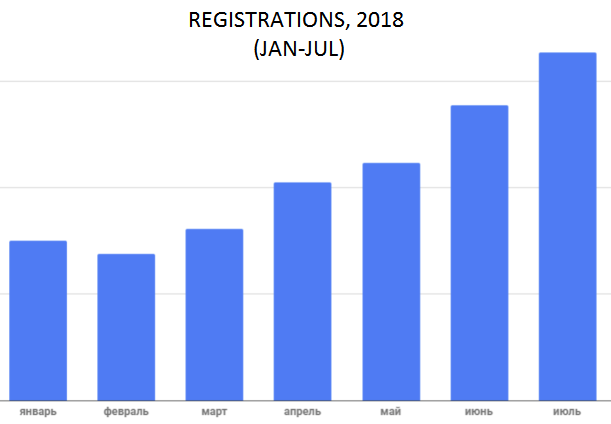 To make it clear: 20% increase in registrations every month means three times growth in 6 months. Things got more complicated because of relatively small market of financial and managerial accounting for small businesses in Russia. More importantly, a 20% growth is not enough. You still need to maintain or better reduce the CPL (cost per lead). We introduced a plan to increase registration rate by 20% each month by the end of the year. The bolder your plan (for registrations, sales, anything) the better. Your subconscious is going to look for ways to carry it out and will definitely succeed if your approach is consistent. Sales Bonus = Fix1 x (Actual sales/Sales planned). Bonus for Leads = Fix2 x (Actual leads/Leads planned). If “actual/plan” is <0.5 in one of the cases, then the bonus is withheld. When part of the bonus is tied to sales, the eternal conflict between marketers and sellers is reduced to a minimum, everyone is heading in one direction. If it was my call, I would have tied the bonus portion of absolutely every employee of the company to sales. Do you have a clear image of what your clients look like? Not literally. I mean, do you know what real problems and tasks they have? Where do they get information they need and what are they really concerned about? This realisation alone can make you better than 90% of companies on the market. Studying your target audience and consistently updating the data you have on it is the basis for attracting customers. This is what drives all the texts you write for advertising campaigns, publications you make on your own and third-party resources, segmentation, CTA of your email blasts etc. Are entrepreneurs your target audience? You need to understand an average portrait of a small business owner. Decline in sales, growth temp decreases, a lot of draining routine. Not enough time: sales, accounting, taxes, legal aspects, reports, HR — it all requires understanding and entrepreneurs just can’t handle it all on their own. Cheap and convenient business automation services are hard to find. Expenses optimization (make it cheaper and more efficient). Control all business KPI and have enough time for it. Tell profitable business line from detrimental ones and get rid of ineffective employees. Save time with automated financial accounting. Gain the ability to predict financial outcomes on various levels and avoid over-expenses. Gain full control and systemise financial accounting as well as financial flow. At any point in time you will be able to tell exactly how much money you can siphon out of your business, what lines of business are detrimental and make sure there’s no cash gap. Financial accounting is a very time-consuming process, so you better save your time to spend it on sales, business, family, travels and leisure. As a service we are able to automate and significantly simplify your workflow several-fold, allowing you to have a clear overview of your finances and ultimate control. Inbound marketing is known for eight years (I’d rather call it content marketing), but very few companies have been using it systematically. Creating and distributing useful content for the target audience generates leads and makes them ready to pay sooner or later. In order for company to grow steadily, content needs to be available at an early stage. Different stages of inbound-marketing require different content, and its distribution channels will also be different. Customer portrait is of course to be considered in this process. Here’s a brief overview of these stages. You need to broadcast the most useful content that people will willingly “share”. Focus on the main “headaches” and problems clients have. Do not speak about your product or mention it only briefly, if it cannot be avoided. You need to catch the target audience on a hook, make them subscribe (to a blog, newsletter, social network) or register. Potential clients will ideally leave contacts and enter your sales funnel. From now on they know your company exists. You should create more specific, useful content that concentrates on problems and ways to solve them. The content must mention your product. We have a financial accounting service. We discuss and take a look at financial problems our target audience may have, provide a clear understanding and get people familiar with solutions, including the one we provide. As a result potential clients realise they have problems with financial accounting, start looking for a solution and know that you are out there as a solution. You should create content that shows how well your product solves problems and why you can be trusted. Success stories, customer reviews, review articles, interviews with clients, web seminars on the product are all perfect here. Contractors you work with (agencies or remote freelancers) should contact you closely and constantly. You have to do everything together: form semantics, list negative words, split ads by regions, conduct experiments and what not. Otherwise, you’ll get high CPL, a couple reports a month, complaints about a greedy search engine and barely acceptable ROI. In our case, the ideal option was a staff specialist on marketing and AdWords. Together we rewrote all the announcements, ads (always checking up with the buyer persona) and conducted a bunch of experiments. As a result, we managed to decrease CPL in Adwords, increased the quality of traffic and boosted website conversion. Now we adjust advertising at least once a week, trying to automate what we can and doing the rest manually. Meticulous approach to contextual advertising and a decrease in CPL will allow you to raise rates during “rough times” and, while maintaining acceptable ROI, even increase registration numbers. For example if you look at the query history of “financial accounting”, “management accounting” and the likes in Google Keyword Planner, you can see a significant decline in the summer months. It would seem that SEO traffic for all key queries drops threefold and everything is lost. It is the same thing with contextual ads. Our move? We raise Maximum Cost Per Click rates to keep on the registration numbers on the same level. Yes, the total CPL is growing. But we kick in with other tools: free lead acquisition channels, cross-marketing, PR-story writing, segmented mailings, and many more. As a result, the total CPL returns to normal. Targeted ads on Facebook will work fine if you produce services or sell services to businesses. Try targeting posts and consider several variants of ads dependant on problems of potential clients (back to the portrait section). Experiment and you will get a good ROI with CPC<20 cents. Did you notice that after some updates and changes to you website, the conversion drops? You may implement an impressive new design, go through A/B testing, but the conversion still drops. Introducing a video with customer reviews to the main page we expect visitors to register more readily. Sometimes it turns out that nothing has changed. Making a list of hypotheses. Making changes to the website. There are no magic patterns, designs or buttons. For each case introducing a video to a landing page, that increased conversion by 20%, there is a case where conversion dropped. Using a systematic approach, we increased the website conversion (across all channels in total) by 50% in six months. Whether it is a new product release, introduction of a new technology or an unfortunate production mishap every company has something going on every day. These are all worthy news and events for PR activities. Newsbreaks can’t be bad, regardless of what happened. Even the most boring story can be packed and filed to be useful and interesting for readers of business publications. For example, we had not a single article about our product and its creation story on any significant web resource. What have we done? Conducted an internal interview with the founders of the company (how they started? what were the problems? what are the achievements?) squeezing the real life stories bit by bit. Based on the answers we got, we chose a suitable topic and “message” for our audience. Then we wrote a useful article for entrepreneurs based on real life experience. Published it on vc.ru – “The history of an IT startup. Fall to rise”(8000 reads, more than 100 comments, more than 200 shares, more than 200 registrations in our service). It was amusing to later receive feedback from other web resources offering paid publications: “How much did it cost you?” or “Nah, you’re lying,sir. It can’t be free”. Take a look at your SEO traffic, check contextual advertising. Pick from 10 to 20 of the most popular queries that provide you registration and sales. Make a video for each individual request and publish it on your channel. It’s pretty simple, needs almost no budget and will consistently bringing targeted traffic in. Here is a perfect video explanation to to kick start the thing (from Intercom). Even a low cost production mobile video lasting over an hour can rise to top 3 via “financial accounting” query, but I am sure you can do better. Name the file itself relevantly. Video description: must be informative and clear. Use theses. Using more than 100 words is great. Key words must be listed in the first 100 characters. Name the video to fully reflect the essence of it and make sure it contains Call To Action (if possible). Place keywords at the beginning. Write tags (common for all videos, common for specific videos and playlists, unique to the itself video). Create a preview thumbnail: 1280×720, 2MB or less. Preferably place some text reflecting the essence of the video. Use large font, ARIAL. Make your first comment with contents of the video. Place links to the video on your website, blog, social networks and newsletters. If you have a big company, ask the staff to watch the video to the end, hit likes, enable notification bells, subscribe and share it on their social networks. This is going to raise behavioral factors that are very important in the first couple of days after the upload. Spend $$30-70 to promote a video. Seedr or Adwords will do it. We have a testing list, which we constantly update and expand. There are now more than 15 platforms, tools and experiments we will test in the near future. This is a “safety net” we use it as ready-made action plan when number of registrations drop to keep it going and growing. Arrange a test: allocate a small budget and take a look at the ad efficiency of a website. Use CPA-model to pay for ad campaign. You give your money and you must be guaranteed the result, if your goal is registration. Editor’s note: at GRIN tech for some of our posts and solutions we are able to pull Cost Per Click around 10 cents from AdWords, which means about 1000 users per $100 invested. Will also try Bing PPC later this year. There are many companies, which are not your competitors or at least not direct competitors, but have audiences similar with yours. You should establish contact with them, propose cross-marketing, joint email blasts and collaborate on content. I had zero belief in listings whatsoever. I thought of them as of just another aggregators of services for business. Well, it has become one of the best channels of quality traffic. The main thing is to use it correctly. Collecting and publishing real customer feedback became a part of our business routine. In order to grow confidently, you do not need to look for brilliant marketers, address your clients in a special overly polite manner, carry a photo of Steve Jobs in your wallet, pressure-squeeze creativity out of your employees, or waste three years to write a viral video script featuring shocking scenes. It was this pack of principles, that helped our company grow by 150% in just 5 months. All despite the traffic drop during summer.